Quick summary: Students explore the plants in a park or in their local area. To begin this lesson, students consider what plants are, where they are found and how important they are to people and the environment. They then conduct a safety briefing before heading to an outdoor learning space. Students are then asked to investigate variations in the leaf structures of the plants in their area, with older students speculating about some the reasons for these variations in terms of adaptation. Students will then think about the way plants interact with other elements of nature in their area, including animals or the wind. They will then participate in a circle-writing activity to create a short story based around the plants in their area, and will share this story with the class. Finally, students are asked to reflect on their experiences of investigating the plants their area. 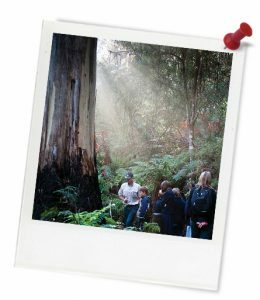 This lesson is produced in partnership with Parks Victoria and is designed to be taught in a natural or outdoor setting. Before conducting this lesson, teachers will need to locate a park or areas of bushland close to, or within, their school grounds. Contact your local council or parks department to find a park near you. Students understand that Australia has diverse and unique flora. Students will recognise variations in leaf structure. Students understand how to write a short story in a group. Years 5 & 6 – Students will understand how plants have adapted to enable them to grow in their environment. Syllabus outcomes: ST2-2VA, ST2-4WS, ST2-11LW, ST3-2VA, ST3-4WS, ST3-10LW, GE3-4, GE2-4, EN2-2A, EN3-2A. Relevant parts of Year 4 English achievement standards: Students create structured texts to explain ideas for different audiences. They re-read and edit their work to improve meaning. Relevant parts of Year 5 English achievement standards: Students create imaginative, informative and persuasive texts for different purposes and audiences. They contribute actively to class and group discussions, taking into account other perspectives. They edit their work for cohesive structure and meaning. Relevant parts of Year 6 English achievement standards: Students create detailed texts elaborating on key ideas for a range of purposes and audiences. They explain editorial choices based on criteria. Topic: Student Rangers, Outdoor learning, Biodiversity. Level of teacher scaffolding: High – Lead students in activities and discussion, ensure students understand and follow safety procedures, supervise students in a outdoor setting. Resources required: Map of the area you will be visiting (contact your local council or parks department for more information). Victorian-based teachers can utilise the following link from Parks Victoria to locate parks: Park locator map. Alternatively, Google Earth can also be used to explore your local area. Keywords: Student Rangers, plants, leaf, adaptations, park. Learning intentions: Students understand that plants come in many different shapes and sizes for different purposes. ... understand that plants have different adaptations. ... identify the variations in structure of a variety of leaves. ...explain reasons why plants are critical to the health of our environment. ... record and draw observations. ... create a short story. Thought starter: What plants have you discovered today? Do you think it is important to visit parks and other natural environments? Explain your answer. Do you think it is important to learn more about the things that live in parks and other outdoor places? Explain your answer. Do you think it is important to look after our local parks and other outdoor places? Explain your answer.